Quantitative assessment of sediment yield and sources is of great importance for future soil and water conservation and watershed management in erosion-prone areas. This study investigated sediment yield and sources by using a simple fingerprinting method in a dam-controlled watershed on the northern Loess Plateau. The sampling sediment profile exhibited 24 flood couplets corresponding to rainfall storms from 2001 to 2014. A total of 2.05 × 105 t sediment was trapped during the period. The annual sediment yield varied from 0 to 430 t ha−1 year−1, with an average annual sediment yield of 146.1 t ha−1 year−1. Ten sediment properties (i.e., σ13C, σ15N, TOC, TN, C/N, Xlf, Xhf, Xfd, 137Cs, 210Pb) were potentially selected to identify the sediment sources. The multivariate discriminant function analysis (DFA) test suggested that three soil properties (Χhf, TN, and 137Cs) comprised the optimum composite fingerprinting. The results demonstrated that sandstone contributed nearly 90% of sediment in 2012 and 56.1% in 2003. The contribution from arable land varied from 5.2% in 2005 to 44.6% within the period of 2013–2014. On average, approximately 74.06% of sediment originated from the weathered sandstone, followed by 15.67% from arable land, and the remaining 10.27% from uncultivated land. Our finding indicated that bare sandstone was the main sediment source, leading to relatively high sediment yield in the study area. 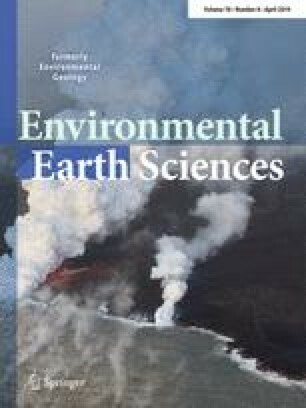 This study provides a method with great potential for sediment yields assessment and sediment source identification in ungauged watersheds on the Loess Plateau. The work was financially supported by the National Natural Science Foundation of China (Grant Nos. 41671279), National Key Scientific Research Project (Grant No. 2016YFC0402401), the special program for Key Basic Research of the Ministry of Science and Technology (Grant No. 2014FY210100), the West Light foundation of the Chinese Academy of Sciences (XAB2017A03) and International Scientific and Technological Cooperation and Exchange Projects in Shaanxi Province (2017KW-043). We would like to express our great appreciation to the Hydrology Bureau of the Yellow River Water Resources Commission for providing valuable climatic and hydrological data, as well as to the reviewers for very valuable comments which greatly improved the quality of the paper.